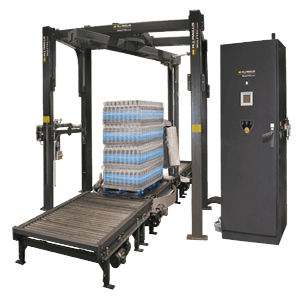 Looking for a pallet wrap machine to keep up with your high-speed applications? The Wulftec WCAT-450 wraps up to 120 loads per hour with 45 RPM combined arm and turntable speed. The versatile turntable and rotary arm design allows you to operate in rotary arm mode, turntable mode or a combination of the two. Available features include a UL 508A-approved control panel, spring loaded carriage gate, wrap height extension and washdown motor. So, no matter your stretch wrapping needs, you can streamline productivity and reduce production costs with the WCAT-450. To learn more about the Wulftec WCAT-450 Combo Arm Turntable Stretch Wrapper, give us a call at (609) 337-3641 or request a quote online. We pride ourselves on being an essential part of your operations team. That means taking care of maintenance and repairs for the lifetime of your equipment. Whether you’re looking for installation assistance, maintenance or emergency support, our factory certified technicians are available 24/7 to discuss your needs.